Timken’s precision thin section bearing line offers high accuracy and low profile design in standard stainless steel or chrome steel configurations. This line includes deep groove and angular contact configurations with special features available to meet specific application requirements. Precision tolerances – meet ABEC 5F (ISO P5) or ABEC 7F (ISO P4) for high running accuracy. 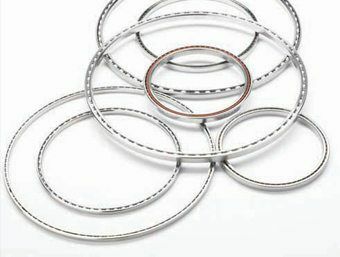 Material selection – standard offerings include 440C stainless steel and 52100 chrome steel. Superfinished raceways – provide a smooth surface finish to reduce internal friction and vibration. High quality ball complement – grade 5 or better balls optimize smooth rolling performance. Retainers – various configurations and materials to meet performance needs.